Art of Africa was founded in January 1991 by Zimbabwean Deborah Norman, in Walton Street, London. Three years later, it relocated to its present position at Fillingdon Farm, an Area of Outstanding Natural Beauty, nestled in the Chiltern Hills of Buckinghamshire. For the next 20 years Art of Africa annually presented two large mixed group exhibitions of original art and craft. In 2014, the gallery was re-launched as Fillingdon Fine Art and continues to exhibit exceptional contemporary paintings, sculpture, ceramics and jewellery by artists associated with Africa. Deborah travels to Africa every year to meet the artists personally and discuss their work, development, processes and inspiration. This individual interaction with the artist ensures a unique and informed selection of art, within the boundaries of taste, quality and style. 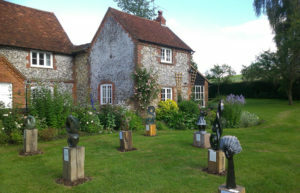 The 300 year old beamed barn at Fillingdon Farm provides a modern yet historical setting for paintings and ceramics, whilst the sculptures look striking against the backdrop of the rolling Chiltern Hills. A far cry from city galleries, Fillingdon Fine Art is a relaxed, calm and aesthetically pleasing environment. Rural fields provide plenty of parking; refreshments are offered, and all ages are welcome to linger and enjoy the art and ambiance. 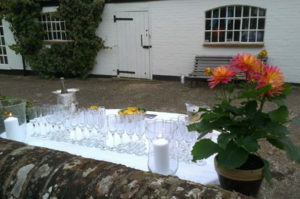 Fillingdon Fine Art is open at set exhibition times throughout the year, in spring, summer and autumn. Other times are by private appointment, and enquiries to purchase can be made through this website. Please do come and enjoy our gallery and benefit from our friendly service and years of experience and knowledge. We look forward to welcoming you.